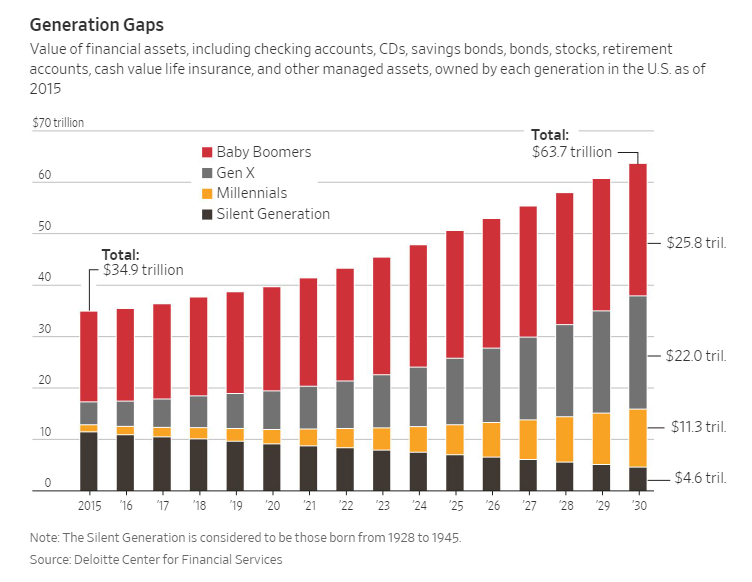 Millennials are expected to have more than $11 trillion in financial assets in the next 12 years. Who will help them manage that money as they get older? The battle between fintech startups and traditional wealth-management firms promises to be a fierce one. Many younger investors are loyal to the fintech startups, which are trying to expand their offerings. The traditional firms, meanwhile, have polished their once-dreary websites and rolled out low-cost options in a bid to attract millennials. “The problem that some of the fintechs will face is that while they were with you when you didn’t have much money, they gave you a great experience and didn’t make you feel like you were less than a full-fledged investor, does that loyalty carry over when your financial needs become more complex?” says Raja Bose, a partner at consulting firm Genpact . But established wealth managers should take little comfort in whatever growing pains fintech firms might encounter. In many ways, this is the newer companies’ race to lose, some observers say. Fintechs, which often started with one product, are now offering many. For instance, Acorns, a platform that helps its 3.7 million users save by investing spare change into exchange-traded funds, has in the past year launched an individual retirement account product called Acorns Later, as well as a debit card. It’s also exploring impact-investing products, which are geared toward social and environmental goals, an area thought to be popular among millennials. “You have a lifelong relationship” with someone if you can help them do something they thought was otherwise impossible, like saving money, says Noah Kerner, chief executive of Acorns. Fund giant BlackRock BLK +0.12% recently invested $50 million in Acorns to help it expand further. Betterment, a robo-advisory pioneer, is also branching out. Last year it launched a premium product for those who have managed to accumulate a significant amount of money—at least $100,000 to keep in a Betterment account. It includes unlimited access to human advisers and carries an annual fee of 0.4% of the account balance. That compares to its digital service, which has no minimum and a 0.25% fee. One advantage the challengers have is that they are digital-first by their nature. That positions them well with millennials, who tend to have either grown up with a digital mind-set or become more digitally dependent than many older investors. Millennial investors “are far more likely to feel that some of the most cutting-edge technology tools are basic requirements of a service offering, rather than a ‘nice-to-have,’ ” according to a 2017 report on millennials and money by Accenture . But the old guard are hardly pushovers. A few years ago, the conversation about incumbents vs. challengers was about apps and interfaces. Fintechs had slicker offerings. But Genpact’s Mr. Bose says incumbents have largely closed that gap. For instance, Merrill Lynch and Morgan Stanley MS +0.11% have launched their own robo advisers with interfaces they believe rival those of the newcomers. They are, however, eyeing customers who already have a few thousand dollars to invest. Merrill Lynch’s Merrill Edge Guided Investing and Morgan Stanley’s Access Investing both have a $5,000 minimum. Betterment has no minimum on its digital account and Wealthfront’s is $500. Millennial customers have “an appreciation for both the high tech and the high touch,” says David Poole, head of advisory, client services and digital capabilities for Merrill Edge, the online side of Bank of America Merrill Lynch’s brokerage business. One way incumbents and newcomers could proceed is by joining forces, says Mr. Bose. Goldman Sachs approach could provide a road map. Although the firm has a long history of serving the wealthy, Marcus by Goldman Sachs, the company’s online consumer bank, is eyeing the same types of customers as the fintechs. Its consumer-loan business, which people often use to consolidate credit-card debt, has no origination fees and low rates, and lets users customize things like the payment date. The minimum size for its high-yielding savings accounts is $1. Earlier this year Marcus bought Clarity Money, an app that lets consumers view all of their financial data in one place, keep better tabs on their spending and see tailored offers for various financial products. One of Clarity’s partners is Acorns. The partnership with Acorns was a draw for Marcus, says Omer Ismail, chief commercial officer at Marcus. Marcus doesn’t currently offer investing tools, but the company is exploring that possibility, Mr. Ismail says. Goldman is leaning on the company’s legacy, Mr. Ismail says, but it is also looking to build trust the way fintechs did it—by addressing specific challenges people face in figuring out their finances. Click here for the original article from Wall Street Journal.